When I choose this retirement adventure I knew that it wasn’t going to be all comfort and luxury. Sometimes you have to take less than ideal transportation to get to places that are off of the tourist circuit. Other times I choose my mode of transportation just for the challenge. It was kind of a combination of these two factors that led Sarah and me to travel on local Laos buses from Tat Lo, Laos to Pakse. 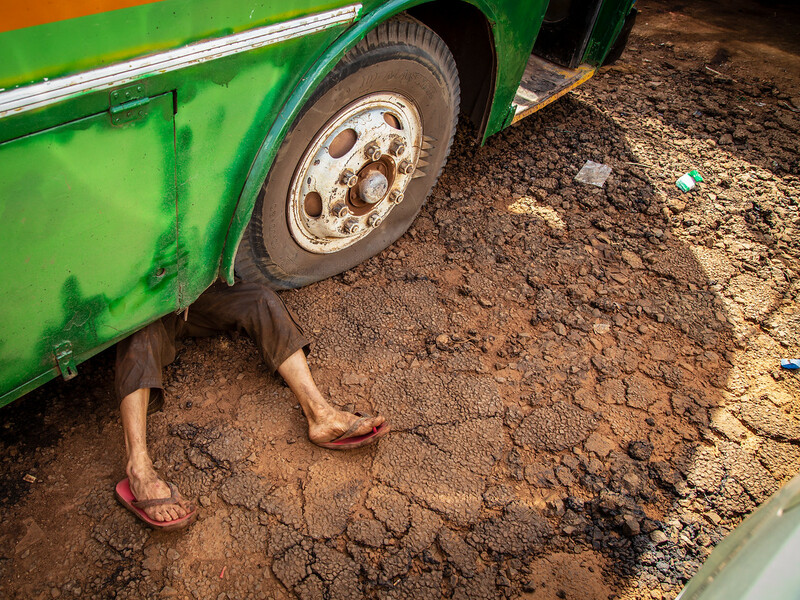 Traveling Laos by bus is an experience, but know what you are getting in to. When we left our guesthouse the owner offered to drive us the 90 kilometers to Pakse in his brand new, air-conditioned Honda SUV for about $40 USD. In retrospect, it was a fine offer, but on balance we felt we had been living a bit too richly and removed from “real life” for too much of our Laos adventure and opted to take the local bus. He kindly drove us to the bus station (a dirty grocery shop about 2 kilometers down the road) and dropped us off about 10 minutes before the bus was due to arrive. But, it didn’t arrive. We sat in the heat in the front of the shop, next to an extinguished charcoal grill stacked high with pork sates basting in the sun, shooing away flies, wiping away sweat and fanning ourselves for two hours. We watched up the road, into the glaring mid-day sun, looking for signs of our transport and saw a varied collection of tuk-tuks, tricked-out pickup trucks, overloaded lorries, a few carts being pulled by water buffalo and motorbikes; but no bus. Finally, we spied a bedraggled green and white, six wheel Hyundai, with what appeared to be more repair putty than sheet metal on the sides, slowly approach the shop and squeal to a stop. It was heading the right direction so we grabbed our backpacks, hopped on board and settled onto a couple of old vinyl covered benches just in front of a guy that looked like he was sleeping off the previous night’s revelry. It was hot, smelled of rice whiskey and diesel exhaust but at least we were on our way. But, we weren’t. The bus drove slowly for maybe three minutes before it turned into shabby dirt parking lot in front of a greasy mechanics shed. Sarah and I looked at each other a bit confused, but at this point, it was starting to get funny so we just laughed. I got out to have a look around and try to figure out what was going on. I found two guys in greasy clothes looking a little confused but working hard to get the lug nuts off of a front tire that was obviously deflated while another guy crawled under the bus to, for some reason, put a jack under the dual rear wheels. After much straining and grunting, they had removed the front tire and went to work removing one of the rear tires. After they got it off, they put the rear tire on the front, put the flat tire inside the bus between the seats in front of the guy sleeping it off (he didn’t stir) and the “busmarm” motioned for everyone to re-board. There was no spare. We were on our way again little worse for wear but at least moving. The mood on the bus seems to lighten up after that little detour. We speak no Laotian and no one on board spoke English, but we did manage some rudimentary communication. The busmarm came to collect the fee for the ticket and moved us to the shady side of the bus so we would be cooler. We all exchanged smiles and everyone laughed as the guy in the back woke up, obviously disoriented; wondering how a huge bus tire got to be in front of him. 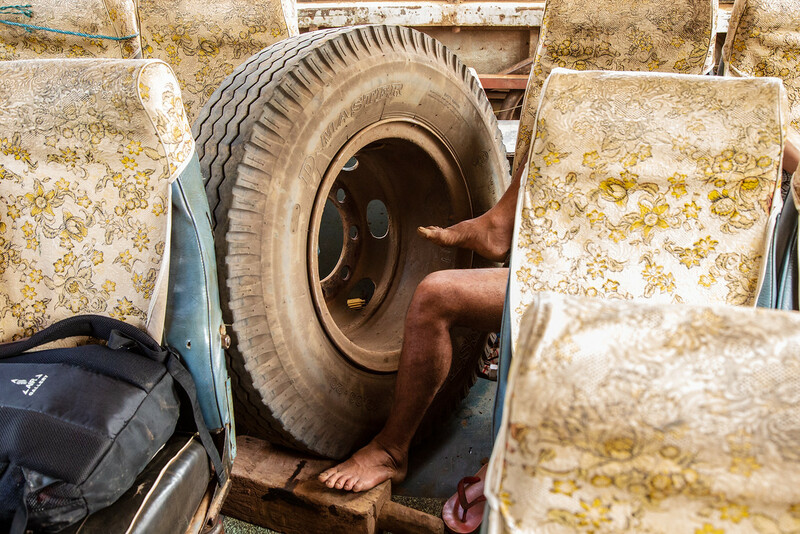 While seeing Laos by bus isn’t always luxurious, the rest of the ride went smoothly despite being a tire short and I was reminded of why I love to travel. But don’t worry not all Laos bus journeys are like this. 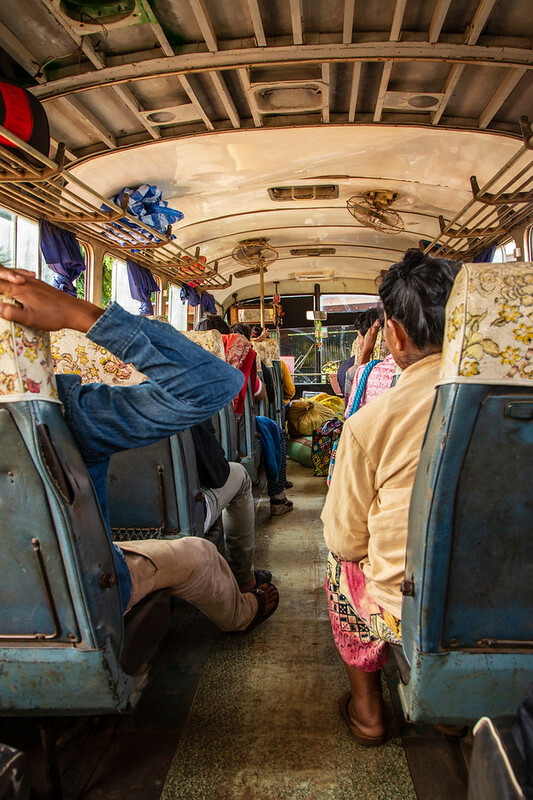 As Laos has no trains yet, apart from a very short journey across the border from Nong Khai to Tha Naleng near Vientiane, the Laos VIP buses are the best way to travel. 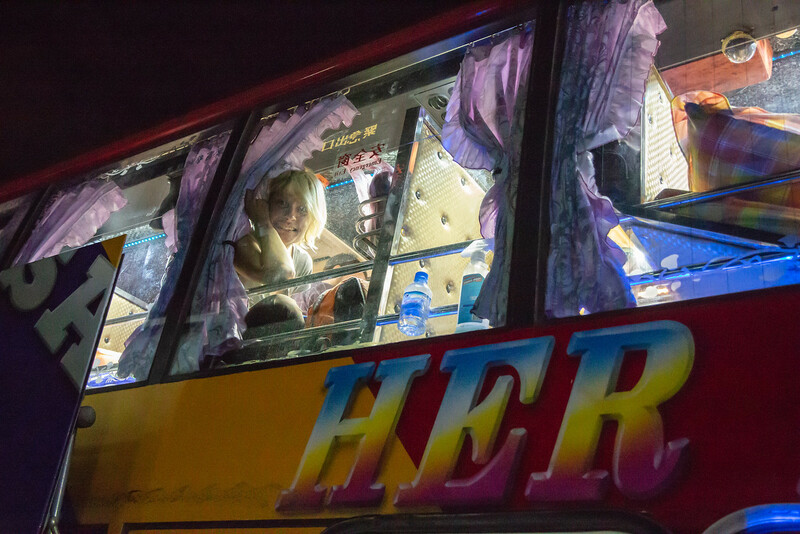 And don’t tell Thailand, but we felt far safer on long-distance Laos buses than on long-distance Thailand buses. The government-owned buses that operate out of Vientiane capital primarily serve the outlying areas with a few heading out to Vang Vieng and Pakse. Most tourists, however, use the VIP buses operated by private companies. They are a little more expensive but more comfortable and the long distance sleeper buses have double beds. Great if you’re traveling as a couple, could be interesting if you are traveling solo. 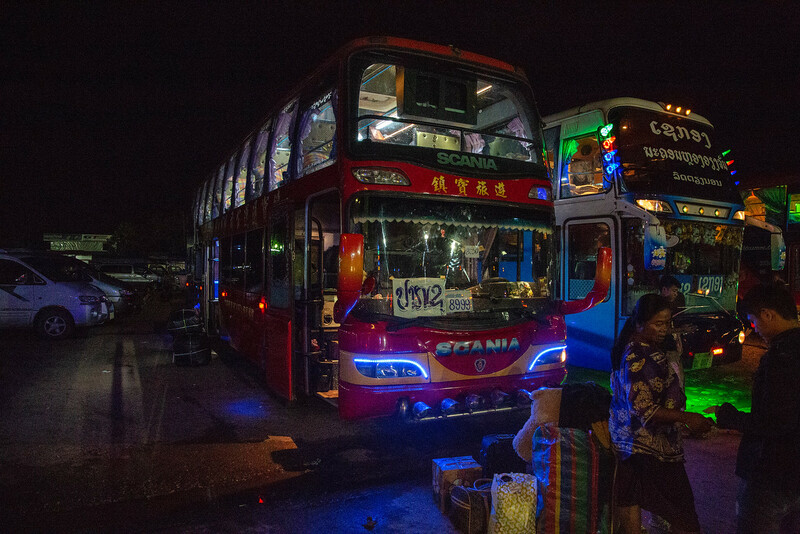 The VIP buses operate out of the Northern and Southern bus terminals in Vientiane which are quite a long way out of the city. It’s far more convenient to buy your bus ticket from your guesthouse or a travel agent and that will include transportation to the bus station. During holiday times such as Lao New Year which takes place in April, it’s a good idea to buy Laos bus tickets in advance. 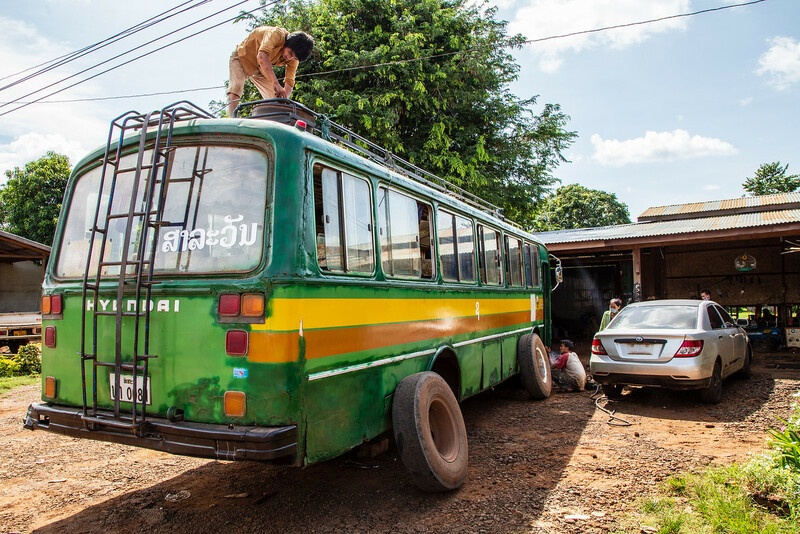 Throughout Laos, you can hail a bus from the side of the road and pay once on board. There’s actually no need to go to the bus station at all but this works better in areas outside the main cities where the buses don’t get so full. Likewise, if you want to disembark, just tell the driver and he will let you off wherever you want. 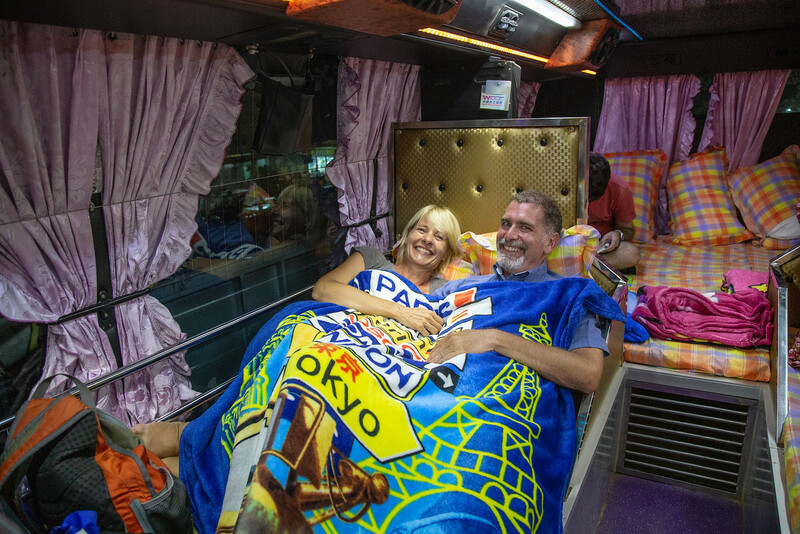 It’s also possible to travel on international buses to neighboring countries – Thailand, Cambodia, Vietnam, and China. These journeys, however, are very long and the roads, especially in the north of Laos, are not good. Maybe consider flying or making your way to Thailand where there are a number of low-cost airlines.